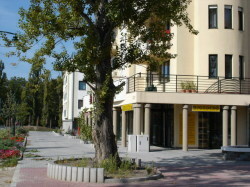 Welcome to our selection of holiday rentals in Hungary. Budapest, the capital of Hungary originated from two cities Buda and Pest that sit on each side of the Danube � Europe�s second longest river. Its prominent Buda Castle stands proud in its historical surroundings. The foundations of the castle were laid in the 13th century but were practically destroyed by the Mongols. The Palace was built in the 18th century but it too suffered from the great fire of 1810, the uprising and later from the bombing of the Second World War. Nowadays, it enjoys some extensive additions and over 200 rooms housing many of the country�s museums including the Budapest Historical Museum and the National Gallery. The Pest side of this great city is where the parliament of this country resides and the Hungarian National Museum housing containing prehistoric relics and the gold baton of the famous Hungarian composer Franz Liszt. There are also other museums such as the Museum of fine art and the Ethnographic Museum. Connected to both Buda and Pest is Margaret Island is a park that offers a stadium, rose garden, fountains and swimming pool which is ideal for relaxing. There are also many hot springs here too. Other significant places of great interest outside of Budapest are the once royal stronghold of Visegrad which nowadays is a pleasant relaxed place with scenic views over the Danube; Esztergom is home to the largest basilica in Hungary and also hosts some of the finest art exhibits as well as the museum of The Stronghold and the Christian Museum; Lake Balaton and the surrounding area have ancient Roman foundations in Sopron, the Firewatch Tower and Storno house which exhibits Celtic, Avar and Roman relics. There are also ten national parks featuring a diverse range of flora, wildfowl and wild animals for the nature lover, botanists and birdwatchers. And not let us not forget the wonderful trails for the hiker through the Great Hungarian Plain, the mountains of the Alps for the climber and the many sanded beaches of Lake Balaton. Looking for self catering holiday accommodation in Hungary?, then below is a selection of villas in Hungary and apartments in Hungary that can be rented direct from their owners. You can either click on each listing for further details or you can use our search engine on the left if you are looking for something in particular.